The Body of Christ: Who was Simon Peter? The Apostle Peter, also called Simon Peter or Simeon, son of Jonah or John who was born in the village of Bethsaida in the province of Galilee. He had a brother name Andrew. He was a fisherman by profession with his brother and and the sons of Zebedee, James and John. He was also married. He then met Jesus and his life changed forever. Does your pastor preach and teach like Peter? Peter was a traditional Jew in the sense that he believed in the coming Messiah that has been prophesied in Hebrew scriptures. His brother Andrew was a disciple of John The Baptist and heard him preach about Jesus and started following Jesus. He then went to Peter and told him about Jesus saying, "We have found the Messiah", and then brought Peter to Jesus. He then became a follower of Jesus and left everything behind (Matthew 19:27). Later, Peter's mother-in-law was healed by Jesus at their home in Capernaum (Matthew 8:14). Peter was a bold individual who was part of Jesus' inner circle of 3. He was privileged with seeing the most amazing works of Jesus personally. When Jesus walked on water, Matthew additionally describes Peter walking on water with Jesus for a moment but beginning to sink when his faith wavers. (Matt. 14:28–31). He was present to witness Jesus' major miracles first hand. He is also frequently mentioned in the gospels as forming with James the Elder and John a special group within the Twelve Apostles (Mark 5:37, 9:2), present at incidents at which the others were not present, such as at the Transfiguration of Jesus (Matthew 17:1). Later Jesus foretold that Peter would deny him three times before the following cockcrow (Matthew 26:69; Mark 14:72). In the Gospel of John, Peter, in one of the resurrection appearances of Jesus, three times affirmed his love for Jesus, balancing his threefold denial, and Jesus' forgiveness and reconfirmed Peter. When Jesus was arrested, one of his companions cut off the ear of a servant of the High Priest. The Gospel of John also includes this event and names Peter as the swordsman and Malchus as the victim.(Jn. 18:10) Luke adds that Jesus touched the ear and miraculously healed it.(Lk. 22:49–51). While on trial, Peter denied knowing Jesus three times just as Jesus said he would. There is no doubt that he would have been present in the crowds (Mark 14:54) that watched Jesus carry his wooden beam to the cross to be crucified. After walking with Jesus, being there at his arrest, trial, crucifixion, empty tomb, post crucifixion appearances, and lastly the ascension; He had absolute faith in Jesus. He preached the powerful sermon on the day of Pentecost and witnessed the descension of the Holy Spirit and the birth of the Church (Acts 2:14, 3:12). From then on he worked diligently on building Christ's church (Mark 16:20). At the Council of Jerusalem (c. 40-50), the early Church, Paul and the leaders of the Jerusalem church met and decided to embrace Gentile converts. Acts portrays Peter and other leaders as successfully opposing the Christian Pharisees who insisted on circumcision. His initial work was conducted in Jerusalem but later the traveled to Antioch and Corinth and finally to Rome. But his upbringing and cultural heritage was still of the Jewish faith. According to the epistle to the Galatians 2:11, Peter went to Antioch from Jerusalem where Paul rebuked him for separating himself from Gentiles. Dionysius, bishop of Corinth, in his Epistle to the Roman Church under Pope Soter (A.D. 165–174) declares that Peter and Paul founded the Church of Rome and the Church of Corinth, and they have lived in Corinth for some time. "You have thus by such an admonition bound together the planting of Peter and of Paul at Rome and Corinth. For both of them planted and likewise taught us in our Corinth. And they taught together in like manner in Italy, and suffered martyrdom at the same time." According to the writings of Origen and Eusebius in his Church History (III, 36) Peter would have been the founder of the Church of Antioch and "after having first founded the church at Antioch, went away to Rome preaching the Gospel, and he also, after [presiding over] the church in Antioch, presided over that of Rome until his death" After presiding over the church in Antioch by a while, Peter would have been succeeded by Evodius, and after by Ignatius, who was a student of John the Apostle. He, with Paul, established and appointed leaders of these newly born churches. The writings of the 1st century Church Father Ignatius of Antioch refer to Peter and Paul giving admonitions to the Romans, indicating Peter's presence in Rome. Church tradition ascribes the epistles First and Second Peter to the Apostle Peter, as does the text of Second Peter itself. First Peter implies the author is in "Babylon", which has been held to be a symbolic reference to Rome. Eusebius of Caesarea also states: Clement of Alexandria in the sixth [book] of the Hypotyposeis cites the story, and the bishop of Hierapolis named Papias joins him in testifying that Peter mentions Mark in the first epistle, which they say he composed in Rome itself, and that he indicates this, calling the city more figuratively Babylon by these: "She who is in Babylon, chosen together with you, sends you greetings and so does my son Mark." (1 Pet 5:13) Irenaeus of Lyons wrote in the 2nd century that Peter and Paul had been the founders of the Church in Rome and had appointed Linus as succeeding bishop. Clement I, in his Letter to the Corinthians (Chapter 5), written c. 80–98, speaks of Peter's martyrdom in the following terms: "Let us take the noble examples of our own generation. Through jealousy and envy the greatest and most just pillars of the Church were persecuted, and came even unto death. 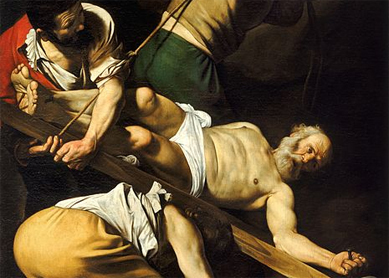 … Peter, through unjust envy, endured not one or two but many labours, and at last, having delivered his testimony, departed unto the place of glory due to him..." Clement of Rome was a disciple of the Apostles, who also was personally antiquated with Peter. The big question is DID Peter go to Rome? The death of Peter is attested to by Tertullian at the end of the 2nd century, in his Prescription Against Heretics, noting that Peter endured a passion like his Lord's: In his work Scorpiace 15, he also speaks of Peter's crucifixion: "The budding faith Nero first made bloody in Rome. There Peter was girded by another, since he was bound to the cross". Origen in his Commentary on the Book of Genesis III, quoted by Eusebius of Caesaria in his Ecclesiastical History (III, 1), said: "Peter was crucified at Rome with his head downwards, as he himself had desired to suffer." These two early witnesses point to Peter being crucified in Rome. Jesus even hints at the death by which Peter would glorify God, (Jn. 21:18–19) saying "when you are old you will stretch out your hands, and another will dress you and carry you where you do not want to go." This is interpreted by some as a reference to Peter's crucifixion. Acts 12 tells how Peter, who was in Jerusalem, was put into prison by King Herod (A.D. 42–44), but was rescued by an angel. After his liberation Peter left Jerusalem to go to "another place" (Acts 12:1–18). Why was this "another place" not mentioned? Probably due to the time of the the writing of this section of Acts, Luke wanted to protect the location and identity from the authorities. He was a now fugitive who escaped from confinement in Jerusalem. The likelihood he remained in Jerusalem, where he had become more famous, as an Apostle of Christ and now a fugitive would be unlikely. Peter then traveling to Rome and given the accounts by Tertuillian, Origen quoted by Eusebius of his death in Rome would make sense. The church in Rome was already flourishing when Paul wrote his Epistle to the Romans about AD 57, he greets some fifty people in Rome by name, but not Peter whom he knew. There is also no mention of Peter in Rome later during Paul's two-year stay there in Acts 28, about AD 60–62. The reason for this is by the time of Paul penning these letters, Peter had already passed away. All this information about what he did and saw is helpful but who was he personally? We can deduce from the amount written about him what kind of person he was. He owned his own fishing business and owned the boat that Jesus used to preach to the people on the shore. A business he went back to after Jesus was crucified temporarily. But once he saw the risen Christ, his business became secondary to the mission of the Church. He made proclaiming Christ and growing the church his main priority. While with Jesus, he was the unofficial leader of the group. Not only was he named first when the Apostles were named together but he, himself, took a leadership role. He was part of the inner ciricle of Jesus. He spoke up first, acted first (some times without thinking). He gave THE sermon at Pentecost. He first spoke up and testified about believing that Jesus was the Son of God. He, along with James, lead the Church in Jerusalem and later traveled to Antioch and Corinth to plant churches. He was a leader, assertive, and a 'go-getter'. He was bold and after being restored by Jesus after his denials, he was fearless. Despite all that he had done and seen, he was still human; a sinner. Jesus rebuked him on one occasion and Paul even had to rebuke him for segregating himself from the gentile Christians and neglecting them. He related to the Jewish Christians better than the Hellenistic and Greek Christians. This actually fairly easy to see. First of all, in his letters, he never refers to himself as holding such an office. Secondly the Bible (the other apostle writings) itself does not suggest the existence of such an office. The argument that Jesus called Peter the rock and corner stone of the church also fails in numerous areas. First, Jesus was the corner stone that was thrown away, not Peter. Secondly in Peter's own writings he describes (1 Peter 2:4) he describes the entire church body as "like living stones". This relates to what Jesus actually told him about being a stone within the church. Yes, he was the part of the first stones (and the other apostles) (Matthew 16:18) that were the foundations of the church, but Jesus was the corner stone of the entire church. Peter himself recognizes that the corner stone is Jesus, not himself (1 Peter 2:7). Peter did not have a special authority over the other apostles (Acts 15:1-23; Galatians 2:1-14; 1 Peter 5:1-5) but it is the Apostles together that were authoritative due to their witness (Ephesians 2:19-20), not Peter alone. Paul does NOT call on believers in various churches to receive Titus, Timothy, and other church leaders based on their authority as bishops or their having apostolic authority, but rather based upon their being fellow laborers WITH him (1 Corinthians 16:10; 16:16; 2 Corinthians 8:23). Peter himself, along with other areas in scripture call people to test what they are taught with scripture and not the authority of a pope (Matthew 5:18; Psalm 19:7-8; 119:160; Proverbs 30:5; John 17:17; 2 Peter 1:19-21). Lastly, Peter himself calls Jesus as THE Shepherd and Overseer of the church, not a pope (1 Peter 2:25). The idea and office of Pope came about later in history and was not part of the teachings of the Apostles. What Did Peter Teach Specifically? There is A LOT we can learn about Peter and how it relates to our day. Peter is not politically correct, especially in our day. He preached about sin and repentance. He talked about hell and false prophets. His teachings about Christian living in a wicked world would make churches like Joel Osteen's fall away. In fact he seems to hint at their coming (2 Peter 2:1-4) and contradicts a lot of the teachings of the Health Wealth and Happiness preachers (1 Peter 2:3,8,18, 2:10, 16, 5:10, and many more, see references above). He also supported that a true godly marriage is between a Man and Woman (1 Peter 3:1-7). He was bold and offended a lot of people, so much so, he was arrest and threatened on numerous occasions. In our day in age people would say that he is not Christ-like! Does your preacher teach like Peter, an Apostle of Jesus Christ?